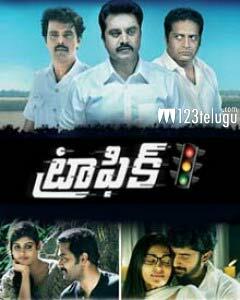 ‘Traffic’ is the dubbed version of a successful and highly acclaimed Tamil movie. South stars Surya, Sarath Kumar, Prakash Raj, Radhika, Cheran and Prasanna have essayed the lead roles in the movie. Directed by Shaheed Khader, the movie has released today across Andhra Pradesh. Let us see how the movie is now. Sathyamoorthy (Cheran)is a good hearted cop who is serving a suspension for taking a bribe. Karthik is a young Gemini TV journalist who is gearing up to interview his favourite hero Gautham Krishna ( Prakash Raj). While proceeding to the studio, he meets with an accident and ends up as a brain dead patient. Unexpectedly, Gautham Krishna’s daughter is need of an emergency heart transplant and Karthik’s heart is the perfect match. Gautham’s wife (Radhika) pleads with Karthik’s parents and they agree to donate the heart. But the trouble has just started. The girl is located in Kodhada in a critical condition and she is in no position to travel. The heart must be brought to Kodhada in a span of 90 minutes . Poor weather rules out the use of a chopper and the heart must be delivered by road. The mission falls into the hands of the dynamic police commissioner Sundar (Sarath Kumar). As he gets about organising this mission, Sathya Moorthy volunteers to be the driver, to redeem his lost honour. He is accompanied on this trip by Doctor Robbin ( Prasanna) and Karthik’s friend Ajmal. A heart stopping road journey follows. Will Sathya Moorthy and team succeed in their mission? Will Commissioner Sundar succeed in successfully executing a nearly impossible mission? That needs to be seen on the big screen. Tamil hero Suriya has a brief but vital guest role in this movie and elevates the movie with his presence. Sarath Kumar has given a superb performance as the police commissioner in the film. He is ably supported by Cheran, who has portrayed the role of the good hearted Sathya Moorthy. Prakash Raj and Radhik are good in their respective roles. A number of Tamil actors have played important roles in the movie and they have all done well . The graph of the movie never dips once the road journey starts. A nice sub plot involving Prasanna and his wife has been woven into the story. The interval bang is quite nice and it leaves the viewers in a state of suspense. A nice and tidy length of 2 hours is a big plus for the movie. The story of the movie is a little unrealistic. Police officials say that the usage of a helicopter is ruled out due to poor weather. But everything looks nice and sunny. The car stops and the occupants get into a scuffle. Is that permitted when you need to cover 180 kms in 90 minutes? Presence of too many Tamil actors and lack of commercial elements might work against the movie in B and C centers. Climax is a little soft. The editor must be commended for doing a very nice job. Cinematography is nice and background music is an asset for the film. Director Shaheed must be appreciated for his direction and for not straying away from the main plot. Traffic is a good suspense drama that will keep you engaged for two hours. Nice performances and very fast narration are big bonus points. However, Tamil nativity and lack of commercial elements might hamper the movie in B and C centers.